This week I wrote a quick post about vegan cooking for The Kitchn. I am not a vegan but I do love a meal that is vegetable centric and if it happens to be vegan, awesome. Many of the vegan meals on this site were not developed specifically to be vegan but rather, a pairing with textures and flavors that when combined, happen to be vegan. 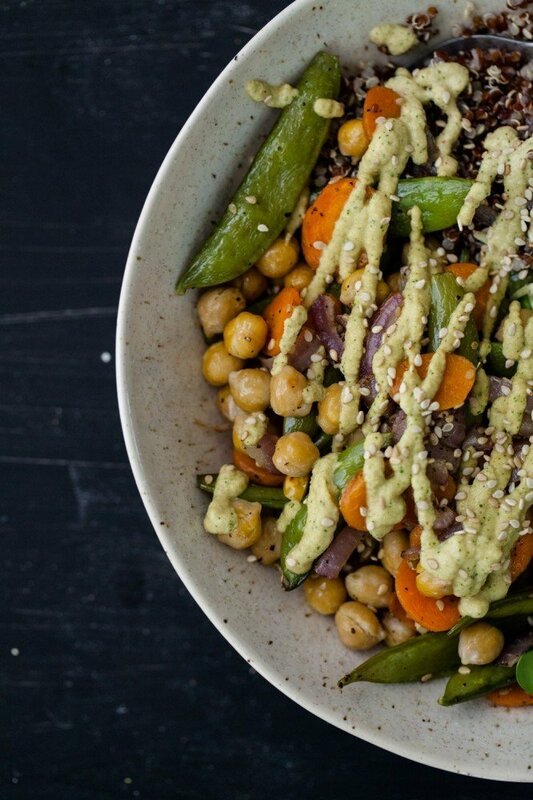 The main star of this vegetable bowl is the cashew cream sauce. I’ve had this on my list to make for a while but it wasn’t until I was hanging out with Alanna and she made a wonderful cashew dip, that it pushed me to finally dip my toe in the cashew water (HA!) I didn’t even look up a recipes but rather dove right in to creating my own version! At least 2 hours before preparing meal, place cashews in a bowl and cover with water to soak. 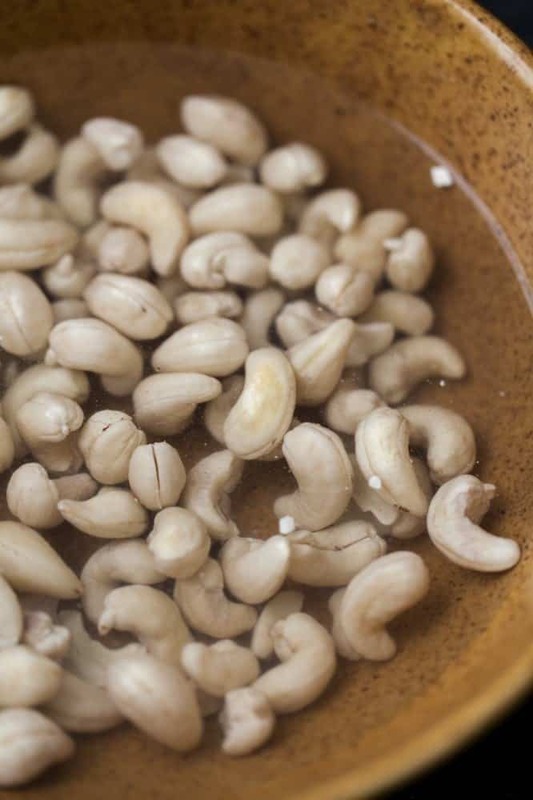 After time, remove cashews from the water, reserving the water, and place in a food processor or blender along with soy sauce, sriracha, and ginger. Pulse a few times, adding water as you go to thin the mixture down. Let the food processor or blender run until cashews are smooth. Add in cilantro and pulse until cilantro is incorporated and in small pieces. Taste and adjust flavors as desired. Preheat oven to 400˚. 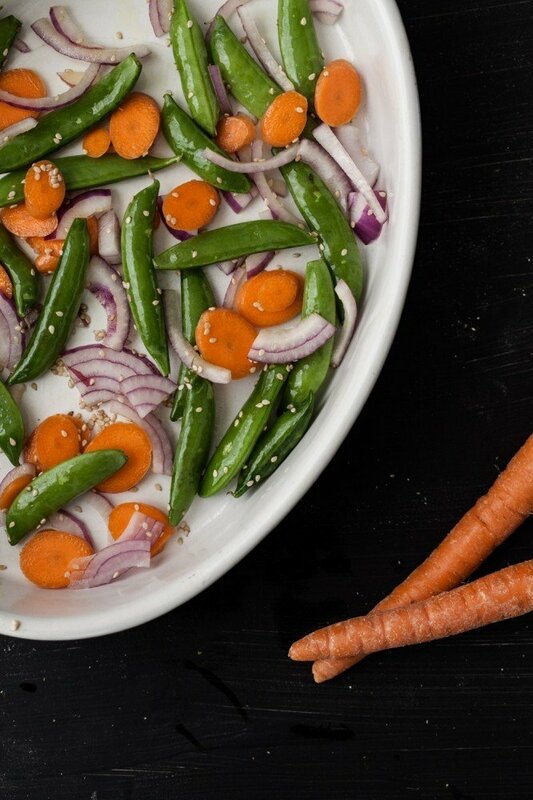 Cut the carrot and onion into bite size pieces and toss in a roasting pan with peas, olive oil, black pepper, and sesame seeds. Roast for 15 minutes then stir in chickpeas. Roast for another 15-20 minutes until vegetables are tender and the peas are starting to blister. 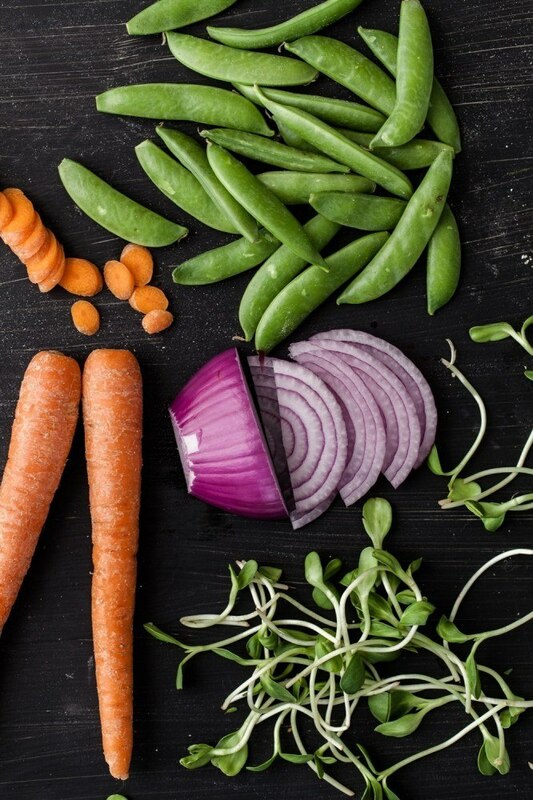 In a bowl, toss together vegetables, grain, and sprouts. Spoon sauce over bowl and serve. Save extra sauce for later uses. The cashew sauce looks amazing, I’ve never even made something like that! Loved your post on The Kitchn, such a great article Erin! This looks delicious! I absolutely love anything involving chickpeas and cilantro, so I’m sold! This looks so amazing! Definitely pinned! ohhhh wow this looks so good! 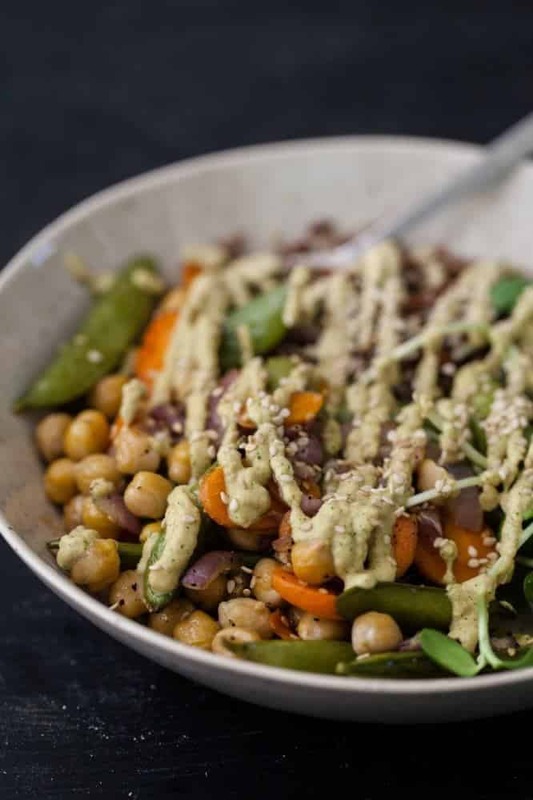 i love nuts in anything, and haven’t made a cashew sauce in ages, so this sounds just perfect! 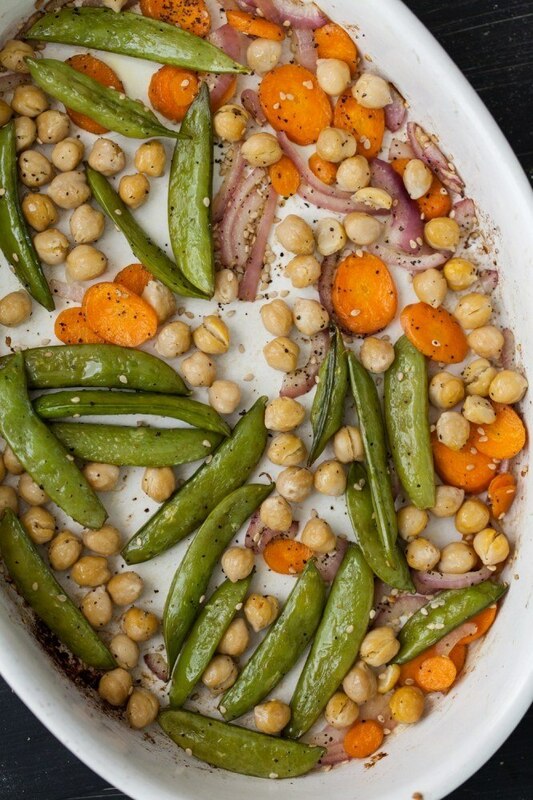 I love recipes where everything roasts in the oven on one pan. And the cashew cream looks amazing, I love playing around with cashew creams! This looks so yummy. 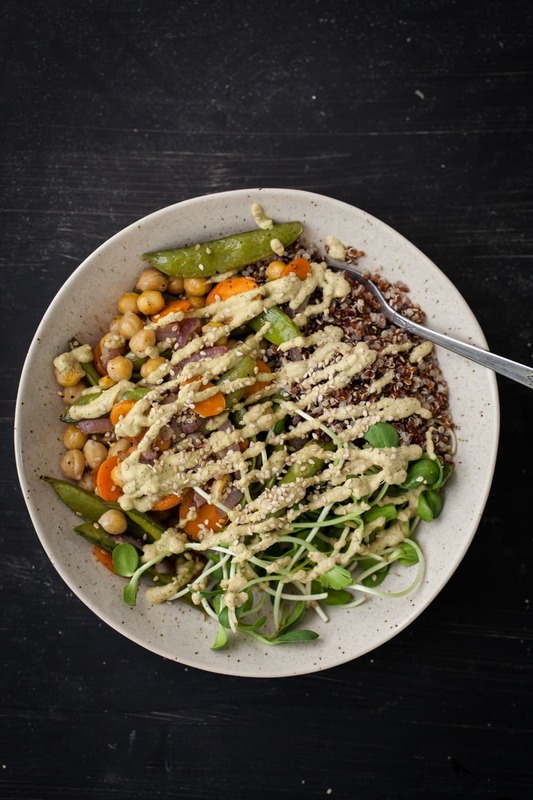 Right up my alley…not a vegan either but I love veggies, and especially bowl food. Just wondering if the cashews are supposed to be raw — or does it matter? I can’t seem to see if it says. Hey Annie, I’ll make that update to the recipe but I used raw almonds! Awesome dish again! I’ve been on the roasted vegetables train these past few weeks. It tastes so awesome and is just sooooo easy! The cashew cream sounds delicious! I really have to get some food processor! That looks like such a delicious and satisfying bowl! I too have been dipping my toes into the cashew water recently and it’s amazing how versatile those things are. Aw, thanks for the shout out, Erin! I’m thrilled that my dip inspired that gorgeous sauce – those flavors sound incredible, as do those bright veggies. Loving these photos! Gosh, this makes my stomach growl… In that good growling way. Like in the way that makes you want to drop all dinner plans and make this! Lovely! I’ve honestly never felt particularly excited about trying cashew cream until seeing this post! Now I want a big roasted veggie bowl smothered in it. Alanna totally has that effect on people! When I had lunch at her house a while back, she introduced me to so many things I never knew I needed in my life. Also, been hearing a lot about cashew cream lately. Definitely need to try it! Absolutely phenomenal dish! Everything about it is perfect:)! This looks great! Should the ginger be ground or fresh grated? Is it a vegan recipe? 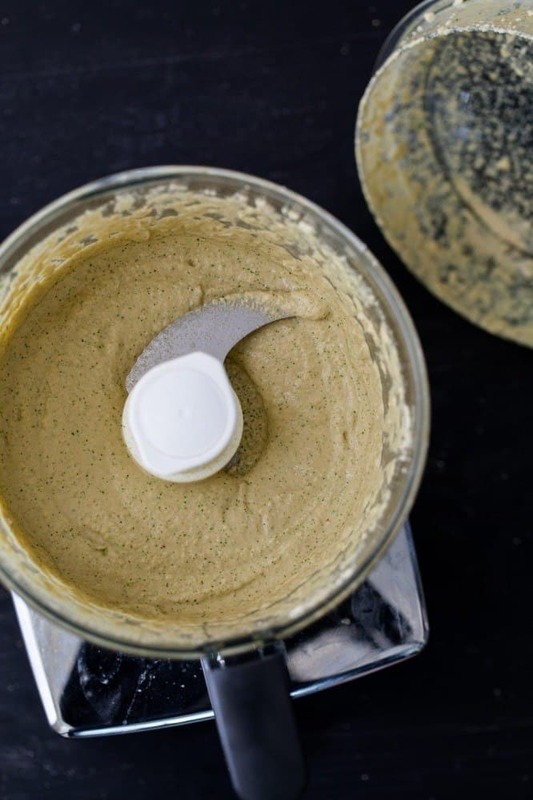 What a great flavorful recipe – I’m just discovering cashew cream and loving it!